One of my roommates, Kelsey, has a very specific, creepy, and somewhat ghastly menace in her life: the undies bandit. Yes, that's right. Within the past few weeks, she has found four pairs of underwear with the crotch cut right in the center. If you were to put them on, it would look like a loin cloth. We have no idea who it could be - they do have an ex-roommate who, let's just say, they did not get along with (she, ladies and gentlemen, is the reason my room smells like cat urine). That's right. 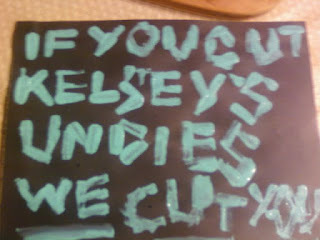 You cut Kelsey's undies...WE CUT YOU. This sign has been taped up against the wall leading into Kelsey's room. Bandit beware, a pair of rusty scissors is in YOUR future! But, for real...who cuts underwear as revenge, or even a joke? I feel very unsafe knowing that their is a crotch-cutting creeper lurking around our apartment...geesh.